After finishing Joi Ito's post Reading the Dictionary, I was reminded that I actually did enjoy reading the dictionary, in same way Seymour Papert liked playing with gears. But, to Joi's point, I didn't set out from aardvark and press on until zebra. Instead, I realized today, the dictionary was my first true hypertextual experience. Since I'm still on winter break, I took the better part of today to mess around with my new (well, secondhand) Kinect. I used the excellent freenect library and its Python bindings to whip up this simple little demo. There's a lot here that is very similar to how we work in SMALLab, especially how we deal with a "buttonless" interface. Using the Z-axis (forward and back on the Kinect, up and down in SMALLab) makes for a pretty nice way of changing from active to inactive state. I'm looking forward to playing with this some more in the future. It's not the most response system in the world, but I can see simple and casual uses for this kind of interaction in schools, public displays, etc. 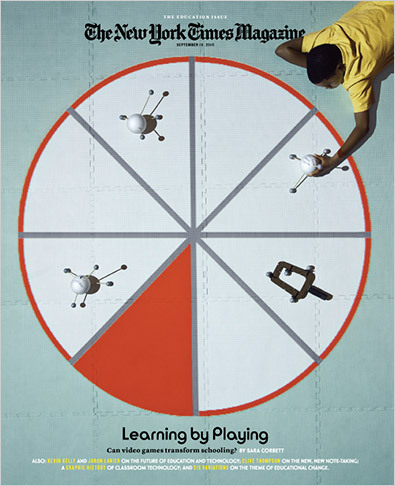 The Education Issue: SMALLab (or a simulation of it) on the front page of the New York Times educational-technology issue.If you picked up a copy of an actual newspaper this weekend (I had to make a special trip for it), you may have seen the cover of the New York Times Magazine with an odd pie chart on it. 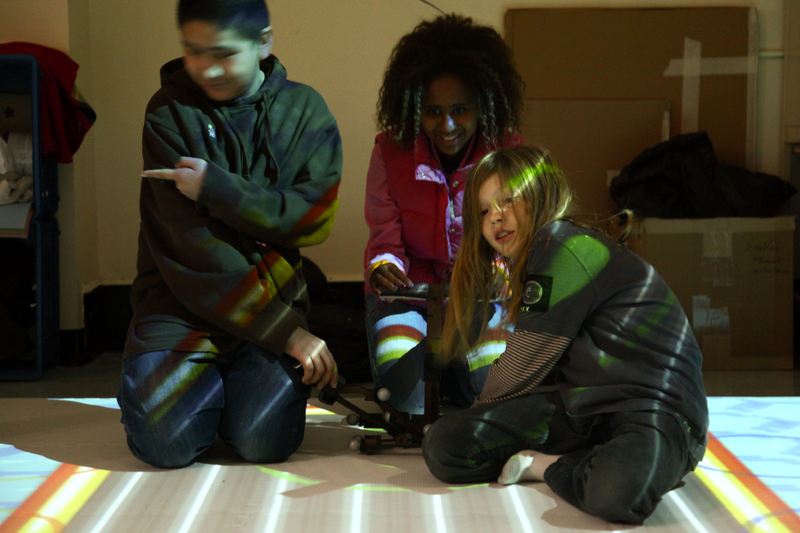 This is SMALLab, one of the research projects that I've been working with for a long time alongside other Parsons faculty and students. The whole issue is fantastic and the reference to SMALLab is in the middle of an article about games in education, much of which focuses on Katie Salen's Quest2Learn school. Definitely worth reading. I thought I'd add a small contribution by breaking down what's on the cover here for posterity. In the top right, Kees is holding one of the mocap controllers that the students made in the classroom at the beginning of last year. It's a big Styrofoam ball with four chopsticks poked into it. Each chopstick is topped with a retroreflective ball, which is what we use to track the position of the controller when we shine infrared light on it from each of the twelve cameras in our OptiTrack system. In the bottom right corner is an example of one of the custom controllers we've made to handle a variety of scenarios in SMALLab. This one is a paddle I designed and built for the Raft scenario. It's one of a series of controllers that Claudio and I made, which also included forms that looked like pumps and metal detectors. The Ball Controller: Look close and you'll see Claudio's name!The whole projection image is something Kyle Li put together. It's not actually a real scenario--he built a fully functioning one that is much more interesting to look at (as well as being playable and fun.) But the Times had this gigantic photography rig over the SMALLab mats on the day they shot, so the motion tracking wasn't going to do much of anything with that hulk in the way. Anyway, that's just of bit of the back story behind the image you see there. We're continuing to develop things with all new controllers and additions to the technology, in many new and exciting subjects, so expect our next SMALLab cover model to be even cooler. 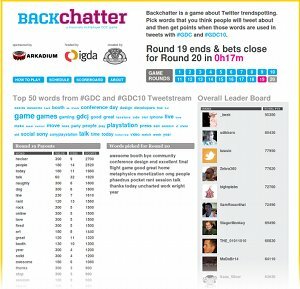 Round 19: Behold the penultimate round at GDC!That's right, Backchatter is now free software! After my colleagues and I at Local No. 12 wrapped up the game the Game Developers Conference this spring, we made the whole thing open source. You can find it on our SourceForge page. And check out our freshly completed documentation. The Local No. 12 crew had a blast running our game, Backchatter, at GDC 2010! As we mentioned in our blog post, the game code is now open-sourced! 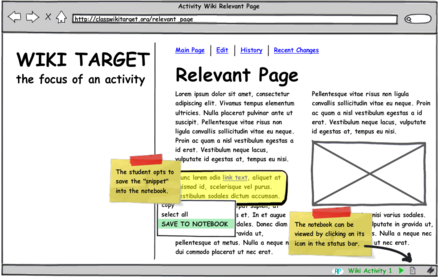 You can find it in our project on SourceForge.net. Great panel session at SXSW! I presented "Playing with 140 Characters" alongside my Local No. 12 colleagues Colleen Macklin, John Sharp, and Eric Zimmerman. We had a very positive reception on the session's twitterfall, which is always gratifying. A really nice end to a busy week up in the air. So, the Android Market had a Drupal app for updating sites like this. Since I'm doing a lot of work these days on connecting sites to other entry points, I thought I'd give this a whirl. Here's another pass at some more of the 9/11 Pager data that was released by Wikileaks this week. I did some work earlier that explains most of what I'm doing. This time, I tried to improve the visualization. I'm also using a directed graph of domain names that appear in the messages as they relate to the unique pager numbers.